Paperback and Kindle, 150 pp. Books about national cultures and characteristics tend to range from the serious (Culture Shock: Widgetonia) to the tongue-in-cheek (They Eat Horses, Don't They?). 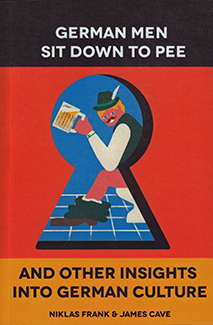 A new book, German Men Sit Down to Pee, occupies a middle ground: It has its whimsical moments, such as "Dig a hole when you go to the beach" or "Don't mention David Hasselhof," but it's also packed with practical and occasionally surprising advice like "Bring your own cake into the office on your birthday" and "Complain about the trains." The book is especially useful if you're planning to live in Germany, but it also offers fascinating insights into contemporary German life for tourists and armchair expats. "Some homes have an S.P.U.K. or WC-Geist, a gadget that issues you with a verbal reprimand if it catches you breaking the rules and standing up. These gadgets are available in many different authoritative yet hilarious (to the Germans, at least) voices such as former German chancellors Helmut Kohl and Gerhard Schröder." Our take: If you have any interest at all in visiting, living in, or simply reading about life in modern Germany, German Men Sit Down to Pee should be on your "must read" list. Niklas Frank (" Real life German - the man behind the concept") is from Deutschland, but he's also lived in other countries such as Sweden and China. James Cave ("Irishman in Berlin--the guy behind the keyboard") is a freelance writer who brings an outsider's perspective to showing how life in Germany is "different, confusing, and often unintelligibly amusing to newcomers." He currently publishes a travel-advice blog about Portugal at Portugalist.com. Amazon offers German Men Sit Down to Pee in affordable paperback and Kindle editions, so look for it online if you can't get it at your local bookstore.